We always knew that it was going to be difficult to travel around SE Asia with the amount of baggage that we've ended up amassing (despite sending packages of clothes and other items to the UK). Mostly it's my fault - too many heavy items, power adaptors etc, not to mention the diving/snorkelling paraphernalia that's been following us around the world. Today was exactly the kind of day when the two backpacks + dive bag + laptop bag proved difficult to lug around. Yesterday Koh Pha-Ngan had a big monsoon downpour, but today the sun came back with a vengeance. Just as we were carrying our stuff along sandy tracks towards the pier. Somehow we survived the transfer of luggage from the pier on to the boat and sat on a lower deck of our boat from Koh Pha-Ngan to Koh Samui to stay out of the sun and try to cool down a little. When we arrived at the other side, we were met by Alan and Ann. Oh, we haven't mentioned them before have we? Well, we hadn't met them before either! Alan and Ann are the parents of one of my sister's friends, and they'd heard that we would be passing through their new island home at some point. While we didn't know them from Adam (and I don't even know an Adam), we called them up because, frankly, they'd seemed quite keen to meet up despite not knowing whether we had atrocious B.O., shocking cases of Tourette's syndrome or some other socially unacceptable habit. Which of course we don't (as far as we know). Maybe they were missing the opportunity of talking with fellow Brits? 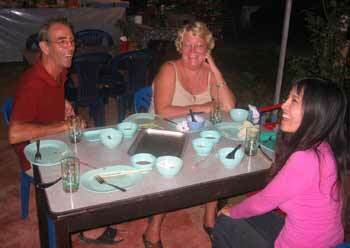 Alan and Ann had been in Koh Samui since April. This seemed like an age ago to us, a time when we had been making our way around New Zealand, and we'd covered a lot of ground since then, including our travels through SE Asia and Thailand in particular. Meanwhile, these two were still being given the run-around by the locals about their plans to build a house on land that they already owned (Official: "Yeah, we can get the electricity in within days." Alan and Ann, both at the same time: "Pah!"). If ever there were an example of working to 'Thai time', this was it. Regardless of the seemingly never-ending trials of setting up home on a Thai island, they both seemed in good spirits and seemed to be looking forward to the day when they could wave goodbye to their rented accommodation. We stayed around the area - near Lamai Beach - for the afternoon, mooching up and down the main street and taking a stroll along the beach itself. The water was anything but swimmable. Unlike Koh Tao's westerly beaches, this eastern stretch seemed to be getting a pounding. The few people we did see in the water were not swimming, but sitting where the waves break, probably scared to venture any further from that spot. 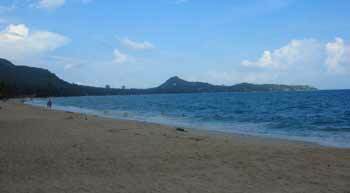 Lamai Beach. Swimmers dare not venture out too far during this season. In the evening we met up with Alan and Ann once again. They had suggested that we try out a Burmese barbecue place they'd frequented before. Uh-oh. Alarm bells sounded. What they were describing was identical to the disaster that was our last - and introduction to - Korean-style cook-yer-own barbecue dining. We had failed dismally then, but maybe we could learn from our mistakes? As it turned out, things went swimmingly. And by that, I mean swimmingly in the sense of Koh Tao's clear waters and not Koh Samui's wild waves. We managed to cook lots of food, all of it edible, and with no change of burnt cooking implements at the half-way mark (I refer you, once again, to our last disastrous attempt). The fact that we had not met Alan and Ann before was irrelevent as we all spent an enjoyable evening sharing experiences of Thailand, reminiscing about what we'd left behind at home and cooking up a storm. We had finally managed to redeem ourselves with this style of cooking and thankfully, it was not a total wash out like last time! A great night out had by all at the Burmese BBQ place.